Philly singer Emerson “Rocky” Brown was a member of the doo wop group the Students, whose best known 45 was “My Heart Is An Open Door” Mommy & Daddy” for Doc Bagby’s Red Top in 1958, reputedly selling over 25,000 copies locally. 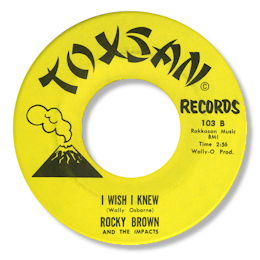 Brown also recorded for a session for Melron in 1961 which included a nice simple doo wop ballad “Why” produced by a very young Bobby Eli, before he cut this super little track for Wally Osborne’s Toxsan concern. I Wish I Knew isn’t one of those in-your-face cuts but it achieves a considerable emotional impact more subtly. The deft piano fills and occasional “screechy” guitar provide the bedrock for Brown’s sensitive and gently breathy rendition. A lovely ballad beautifully realised. Brown was singing with a reborn version of the Students before his untimely death in 1999. 1. The Rocky Brown on Penntowne is a completely different artist. 2. 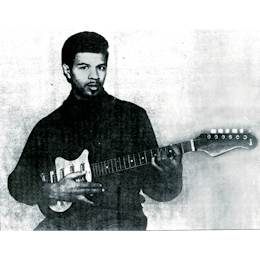 Brown’s Melron tracks can be found on the Philly Archives CD “The Best Of Melron Records” and “I Wish I Knew” on the companion volume “The Best Of Wally-O Productions”.